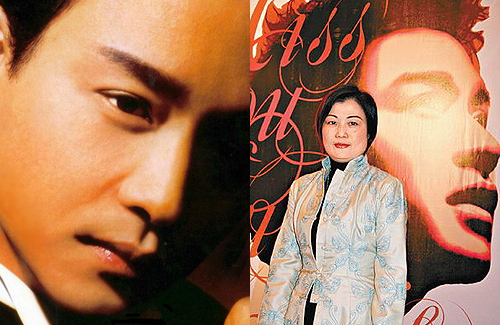 To commemorate the 10th year of Leslie Cheung’s (張國榮) passing, the superstar’s manager of 22 years, Florence Chan (陳淑芬), organized a series of events and exhibitions in honor of Leslie’s achievements and milestones last week. Two large, sold-out tribute concerts were also held on the eve and day of his 10th anniversary death at the Hong Kong Coliseum, which were attended by over 20 top stars in the industry. The commemorative concert also received a live broadcast through Hong Kong’s TVB Jade, and was aired live through streaming websites in mainland China, Taiwan, and Japan. The Leslie Cheung memorabilia has made huge profits, which were announced to go to charity, but recent Hong Kong tabloids claimed that a majority of the earnings actually went to his manager, Florence. As reported by East Week, all $20 million HKD of the earnings went to Florence, which were accumulated from concert ticket sales, DVD sales, broadcast rights, and merchandise sold at the exhibition. The singers who performed at the tribute concert were also exploited, according to the tabloid reports. Each singer only received a meager $10,000 HKD for commuting compensations and a paper crane as a souvenir. It was also reported that each performer had to pay for their own hair and make-up. At the “Miss You Much Leslie” memorial gathering on April 1, in which the audience was given exclusive never-before-seen footage of Leslie, each guest had to pay up to $200 HKD for entrance. Leslie’s partner Daffy Tong (唐鶴德), who made a surprise appearance at the end of event, reportedly did not receive any royalties and was only give a memorial T-shirt as a reward. Florence’s recent appearance at a Macau casino further fueled the exploitation rumors, in which she was seen gambling $10,000 HKD at a time. Also the manager of Jacky Cheung (張學友), who recently set a world record of performing for the largest combined audience for a live act in 12 months, Florence’s net worth reportedly exceeded $300 million HKD as of 2013. Florence further stressed that she did not profit from these events and assured that all of the proceeds will be donated to the End Child Sexual Abuse Foundation. I hope the rumors are false, otherwise, I hope she gets hit by a bus. I kind of felt this was overly commercialized for a reason. If the charity does end up getting every penny of the money raised, I hope that she brings some sort of lawsuit against the magazine for slander. It’s so disgusting to see people fighting over money that is suppose to be raised for a good cause. I doubt the rumors are true. It would be more believeable if she is not Jacky’s current manager. I doubt Jacky would continue to use her as his manager if Florence is a bad person. she gambling HK$10,000 at a time? where did she get so much money? HK$10,000 is peanuts to high rollers. Mrs Chan is not that type of person to exploit Leslie’s memory. She’s a businesswoman and naturally has to recover her overhead costs first. The figure to be donated to charity will be announced soon. She never wanted to do this memorial activities but 3 yrs ago,die-hard fans already started proposing ideas to her and hoping she would do a special 10th year event. When mainland/Japanese fans started folding those origami cranes, she decided only late last year to do it. Those artists who appeared on stage are some of Leslie’s true friends. I’m quite certain that HK$10,000 fee per person is a mere ‘lai see’ or gesture of angpow money. They would have done it for free but probably some rules still need to be observed. It’s whatever. It really is. I’d much rather the money be donated in secret. Like Louis Koo opening schools in China and then saying “yeah, don’t mention it” or Anita Mui opening up various cancer charities and that nursing home in San Fran. She’s a manager, it’s her job. Of course she did! That’s what managers do, fleece the artists who are under their care. In this case, Florence fleeced an artist who is long dead. That makes her the lowest of the low.